Power Mix 1000 ULSD exceeds the requirements set forth by both Cummins and Caterpillar for both cleanliness and anti-wear. It increases the lubricity of ULSD to meet or exceed the specification regarding lubricity in diesel established by the American Society for Testing and Materials (ASTM). This lubricity specification comes under the ASTM D-975 Standard Specification for Diesel Fuel Oils. 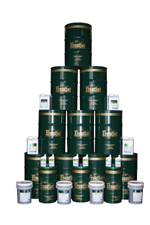 Power Mix 1000 ULSD is blended from pure mineral base oils and select additives that provide: Detergency, Lubricity, Stabilizers, Demulsifiers, Cold Flow Improver, Cetane Improver, Corrosion Inhibitors and Anti-Rust. Recommended treat rate, 1gallon to 1,000 gallons. FOR USE IN DIESEL FUEL ONLY!! 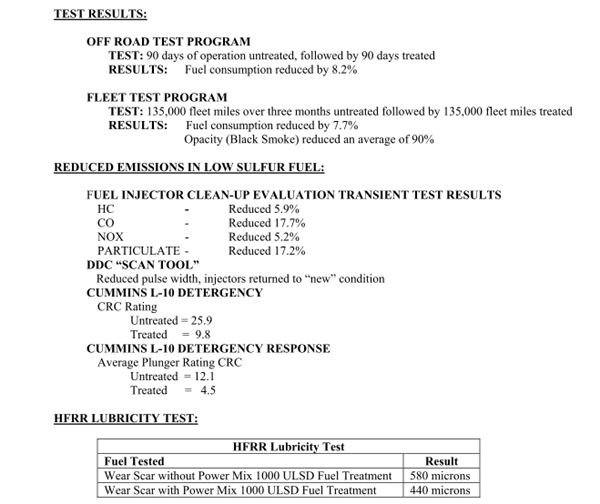 the road fleet testing and an 8.2% decrease in fuel consumption in off road heavy equipment. correct spray patterns are maintained, allowing the fuel to burn more efficiently.